In business or social situations, why is it that some people make such a positive impression? What behaviors actually imprint a person on your memory to the point where that person is unforgettable — while there are other people whom you can’t forget soon enough? What are the actual behaviors that define someone as a confident class act? The answers are found in five key social skills. These are among the most important abilities a person can have. Human beings are social animals — and a lack of key social skills can lead to a lonely life. 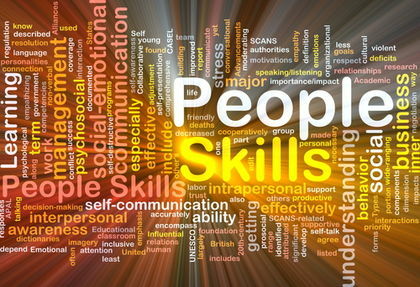 On the other hand, mastery of key social skills can be of great help in every area of your life and career. And while these abilities are inborn in a certain percentage of people, they can also be learned. The first of the social skills is not really anything you do, but how you feel. It’s the capacity to relax in a social or business setting. Stress and anxiety are contagious. When you seem ill at ease, that feeling is transmitted to others around you. If you seem confident and composed, there’s a good chance you’ll encounter that same state of mind in everyone else. In developing the ability to relax, the first step is identifying exactly what it is that makes you anxious. This varies from person to person — but among people who really have a problem with interpersonal situations, there’s one anxiety that’s stands out above all others. It’s anxiety about anxiety. It’s nervousness about being nervous. It’s the fear of being found out as an anxious person — which elevates the very behaviors you’re trying to hide. If this self-confirming anxiety is a problem for you, here’s a suggestion: honesty is the best policy. Without overly dramatizing your feelings, just mention that you’re sometimes a bit uneasy meeting new people or speaking in public. Think about how you’ll do this beforehand. Injecting a little humor is always a good idea. The main point is to be upfront about the issue, and thereby defuse it. Rest assured that nobody is going to hold this against you. In fact, admitting these very human feelings is a great way to get people on your side. Keep in mind also that certain actions act as triggers for anxiety, even though you may think they’re calming you down. Try not to do anything too quickly, whether it’s walking, talking, eating, or even sitting down in a chair. Rapid, jerky motions awaken a primitive fight-or-flight syndrome that’s the last thing you want. So take your time. Sub-vocally, tell yourself to relax. You’ll be surprised at the heightened level of confidence you’ll feel, and the positive effect it will have on others around you. Keep working on your social skills which in turn will improve your life dramatically. How long are you willing to wait to Get Rich?